Today I’m going to share with you guys one of my favorite vegan snacks. Creamy avocado taquitos! These guys are awesome to make for a party or make ahead and have them as a snack throughout your workweek. 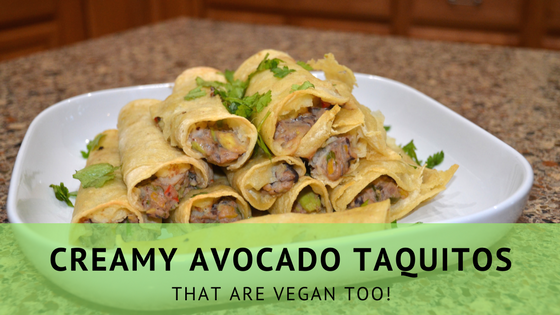 The creamy part of these taquitos comes from vegan cream cheese and avocado mixed together. Then the black bean mixture helps pack a punch by rounding out the flavor. I use jalapenos and cilantro in my recipe but these are completely optional. I know for some people (like my husband) cilantro taste like soap. So definitely leave it out if that’s the case for you or your family. In a food processor combine drained and rinsed black beans, onion, peppers, garlic, and jalapenos. Run on low until the ingredients slightly combined. This helps chop up the ingredients. In a medium-sized mixing bowl mix avocado and vegan cream cheese until combined. Then add the black bean mixture from the food processor and mix well. Add most of the cilantro (save about a tbsp for garnish) to the mixture and salt to taste. Warm up your corn tortillas, I like to heat them in a skillet one at a time, but you can also heat them in a microwave. Either way, make sure to heat them up this makes them more pliable. Assemble each taquito by putting about 2 tbsp of the mixture and rolling. Place each rolled up taquito on a foiled baking sheet seem side down. Move to your serving plate, sprinkle leftover cilantro on top and enjoy!